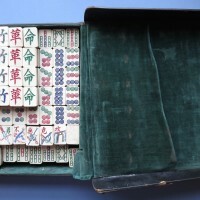 In this Gallery are examples of those sets that have a similar basic suit tile pattern of the Himly/Glover suit type that first appeared in the historical record around 1875 (see Mahjong(g) Before Mahjong(g) part 1). 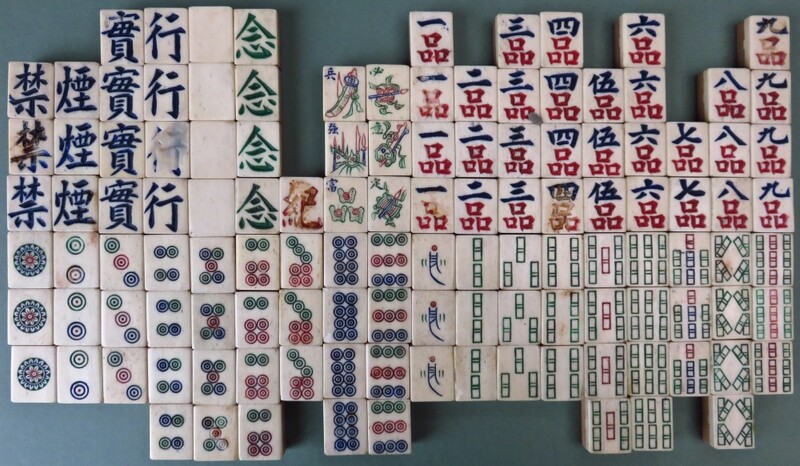 Thus: the presence of extra Joker tiles and/or squat SOC/’Bamboo’ rods and/or concave tiles and/or an abstracted #1 String of Cash/’bamboo’ and finally, a single Circle on all or some of the tiles of the Cash/’Circles’ suit tiles. 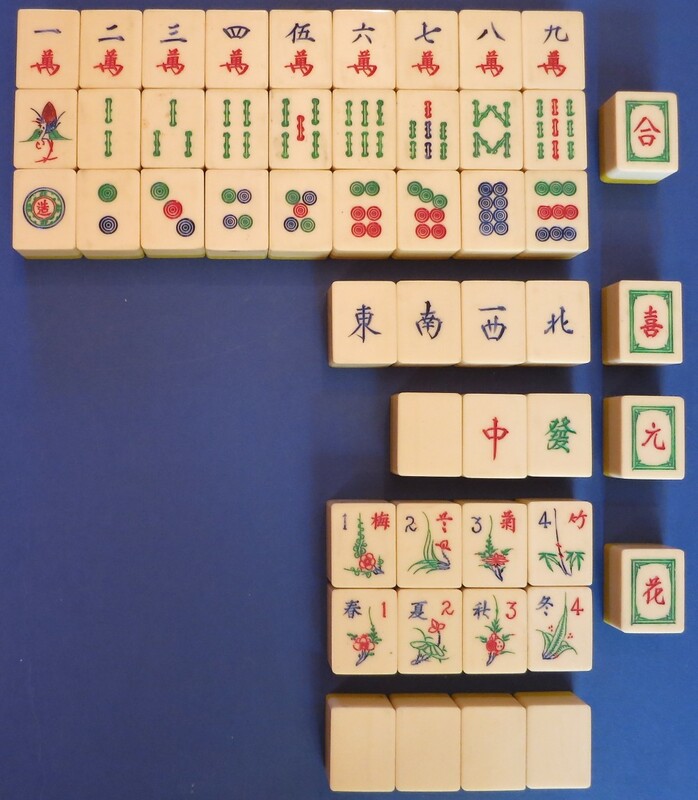 The tile set itself continued with minor modifications well into the late 1930′s and into the 1950′s (see Mahjong(g) Before and After Mahjong(g) Part 2 and Flowers and Kings: A Hypothesis of their Function in Early Ma Que). One particular modification was the replacement of the Directions/Winds motifs and the Honours/’Dragons’ motifs with alternative motifs. This also occurred for the wan/Myriads or ‘Character’ suit. Documented in 1875. 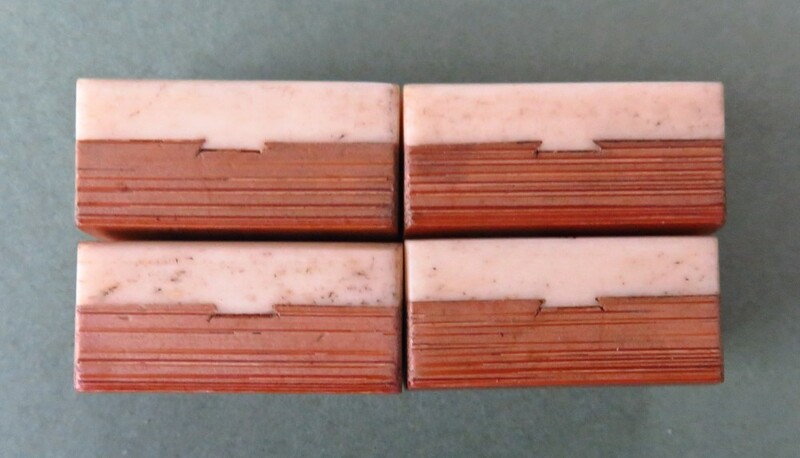 Concave b/b tiles with *longitudinal* dovetail joint. 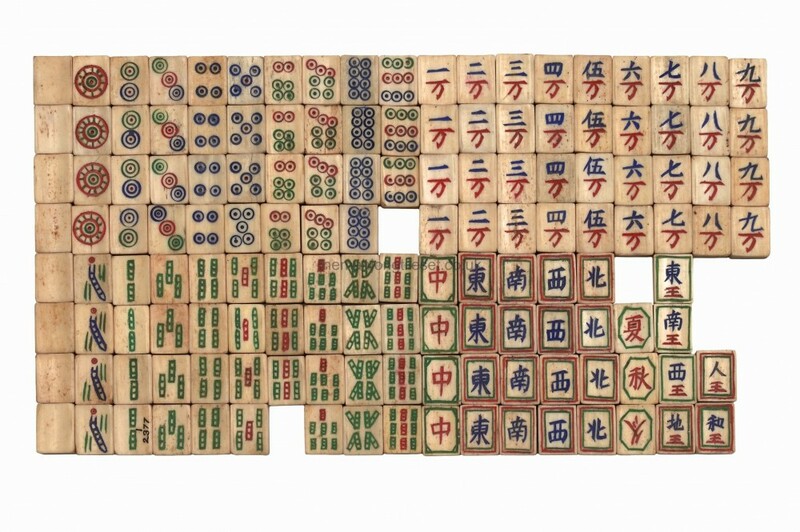 String of Cash on number 1 and single circles on rest of Cash suit tiles. 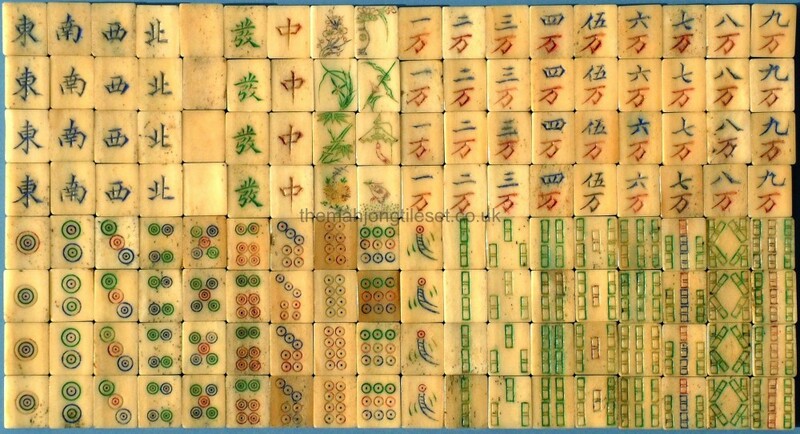 Rectangular rods for the String of Cash/Bamboo suit. AMNH Glover set-1. 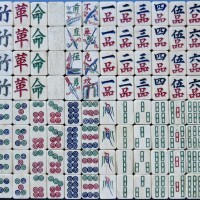 Various tiles, side view. These tiles show the concave shape of the bone top plus the longitudinal dovetail joint. Early features still present. Squarish concave b/b tiles. 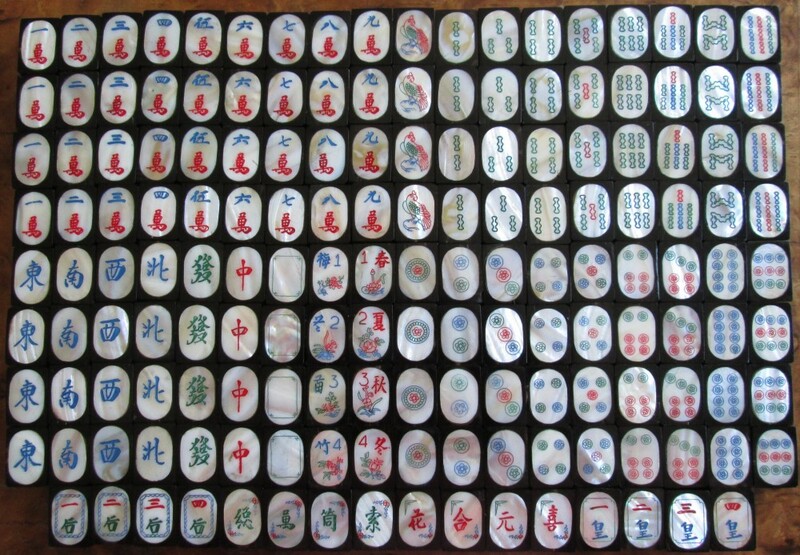 Note; multiple circles used on each tile 1 - 6 in the Cash/Circles suit but still single circles on tiles 7 - 9. Undecorated 1 Cash/'Circles'. Abstracted version of a String of Cash on the number 1 'Bamboo'. Squat, rectangular 'bamboo' rods. Box not original to the set. Bone inserts on the slide top lid. 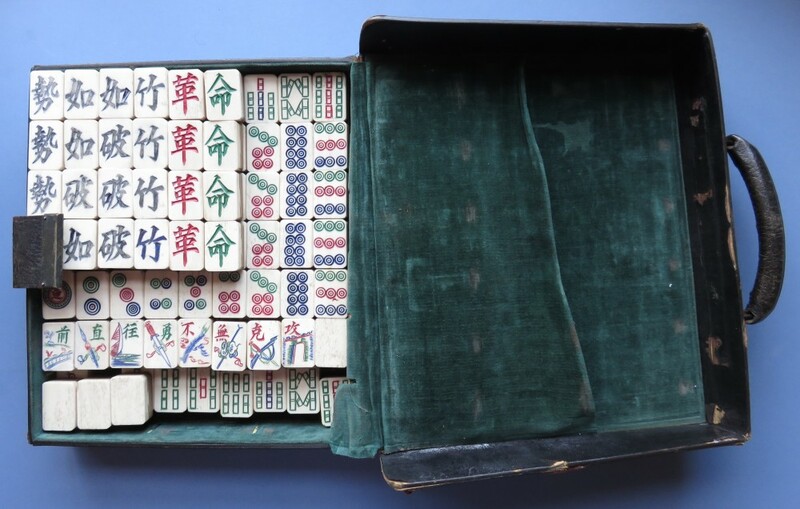 This incomplete set is an example of a rather rare tile Pattern. 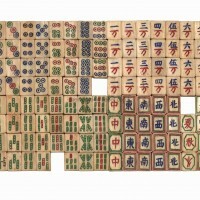 This Pattern is distinguished by the use of very deep, boldly painted engravings, featuring alternative motifs for some of the tile groups such as the use of the pǐn, Rank, motif for the 'Character' suit and alternative characters for the Winds and 'Dragons' groups - sometimes collectively called the 'Honours', as well as the rectangular and rather squat 'Bamboo' rods and the use of a rudimentary 'String of Cash' motif on the #1 Bamboo tiles. These last two features are similar to those depicted in the previous Pattern and also place this type of set in the Himly/Glover section. 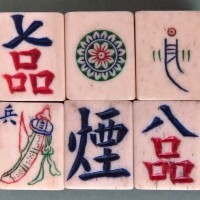 Close-up of the 'letter' tiles used as alternatives for the four Winds/Directions and for two of the 'Dragons'. 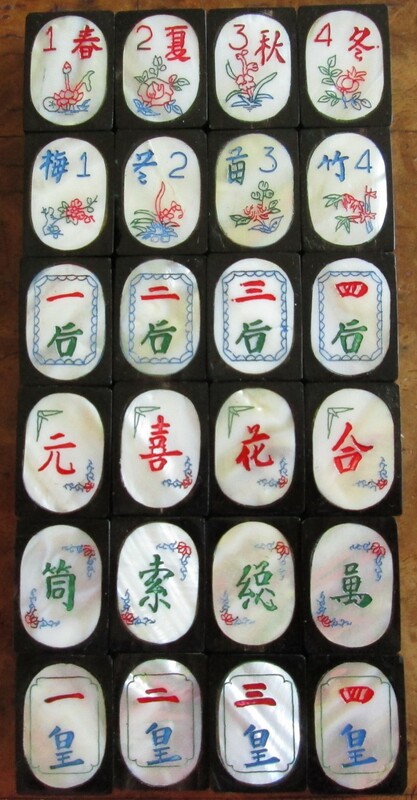 Their ordering, from left to right, is 實行禁煙, shíxíng jìnyān, literally translated as "implement", "ban", "smoke/opium". 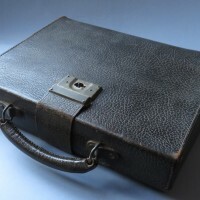 This interprets as "to implement a ban on opium smoking and the opium trade". 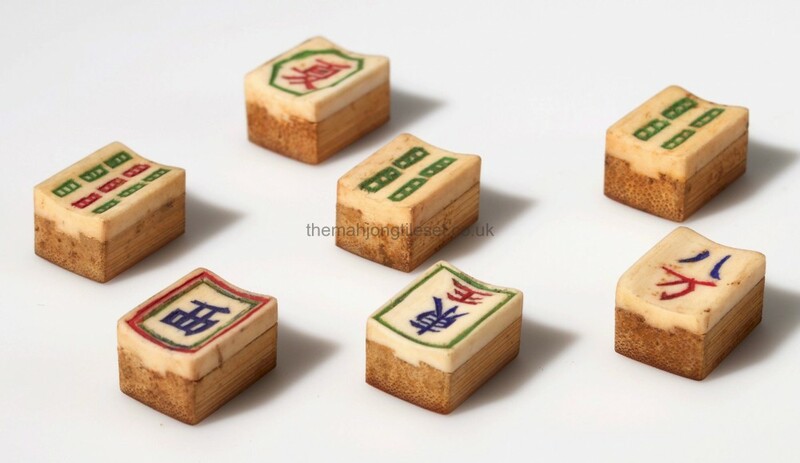 The red 'Dragon' is 紀, and together with the green 'Dragon', 念, the two mean "to commemorate". 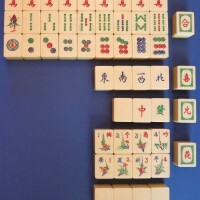 紀念, jìniàn. 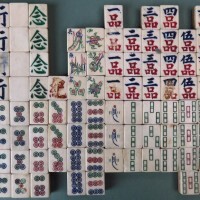 Close-up of a selection of tiles, illustrating the square dimensions of the tiles. 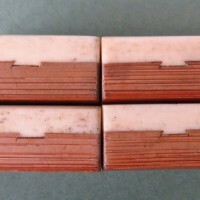 Side view of tiles showing small dovetail joints. 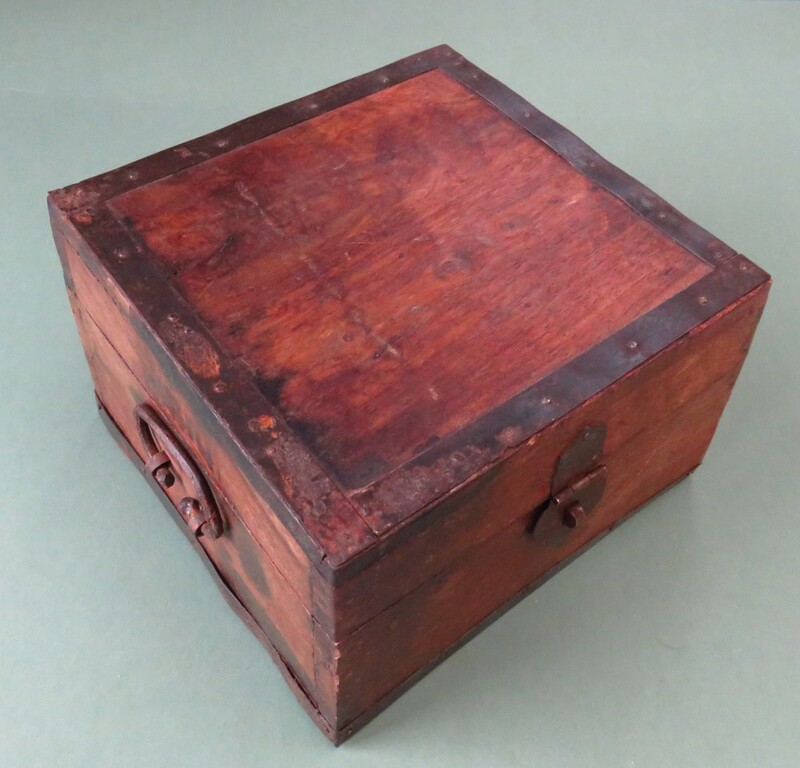 This box is probably not original to the set but it was with the set at the time of acquisition. 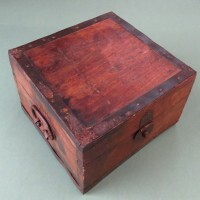 View of box showing handle and metal supports. 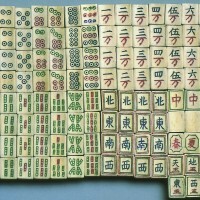 This set illustrates the complete Pattern in the previous tile set. 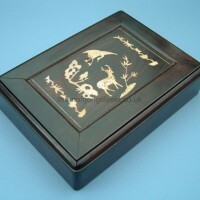 This pattern is again distinguished by the use of very deep, boldly painted engravings. 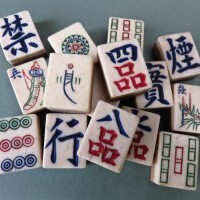 Again there is the use of alternative motifs for three of the tile groups. Thus the use of the pǐn, Rank, motif for the 'Character' suit and alternative characters for the Winds and 'Dragons' groups - sometimes collectively called the 'Honours'. 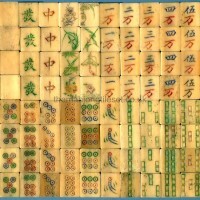 Further distinguishing characteristics are the rectangular and rather squat 'Bamboo' rods and the use of a stylised motif a bird on the #1 Bamboo tiles. This motif was originally a very simple String of Cash that was further formalised into the shape of a bird. These features are similar to those depicted in the previous Pattern and also place this type of set in the Himly/Glover section. 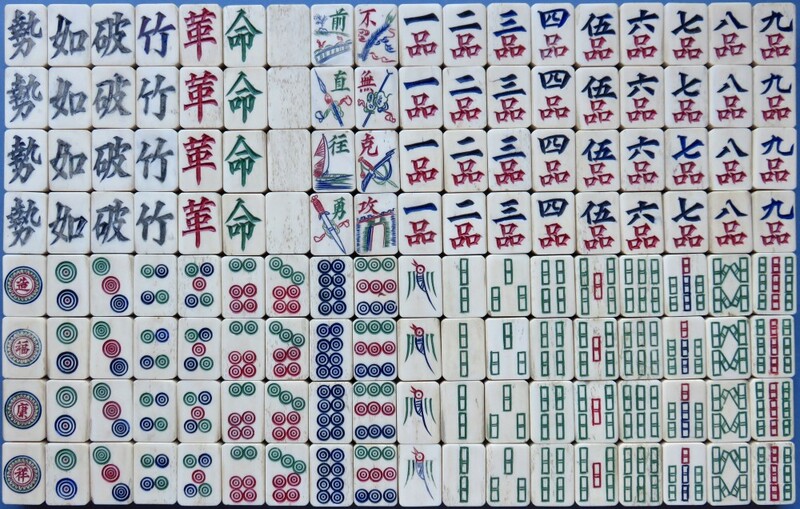 The large 'letter' tiles in place of the Directions read as (from L-R); shì rú pò zhú = "like splitting bamboo". 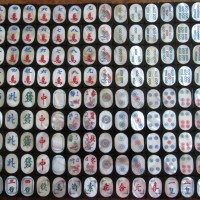 A few web sites suggest the phrase dates back 1500 years when General Du Yu led troops attacking the State of Wu and achieving many victories; when suggested that the troops should rest he said "now the morale of our troops is very high, attacking Wu is just like splitting bamboo; having split open the first few joints, the rest will be easily split". This idiom has then come to mean "an irresistible force". The two of the 'Dragons' read as (L-R); gè míng = "revolution". When both phrases are combined we have "an irresistible force of revolutionary change". 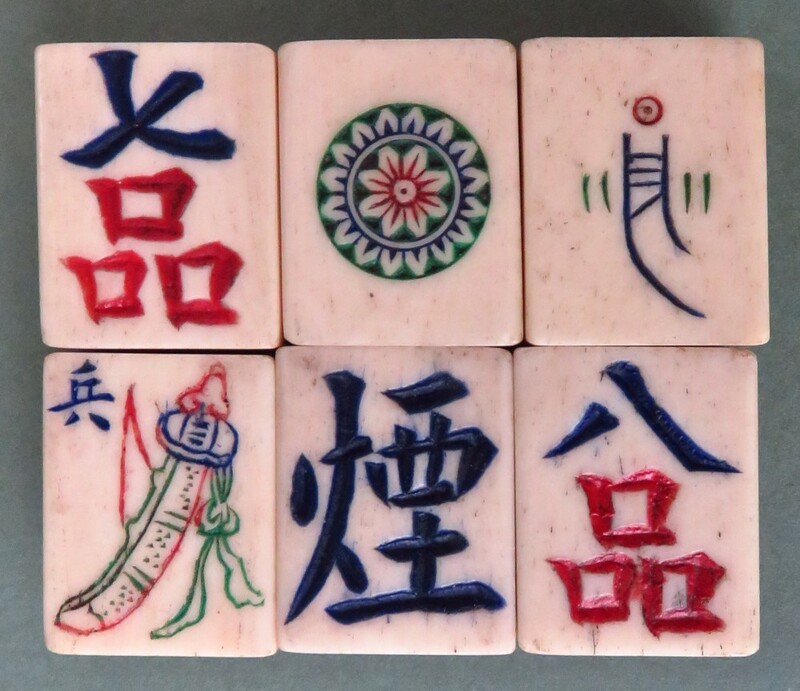 The two sets of Flowers read (from R–L and top row 1st); yǒng wǎng zhí qián = "advance bravely". 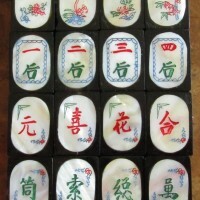 The bottom row reads (R–L); gōng wú bù kè = "ever victorious". 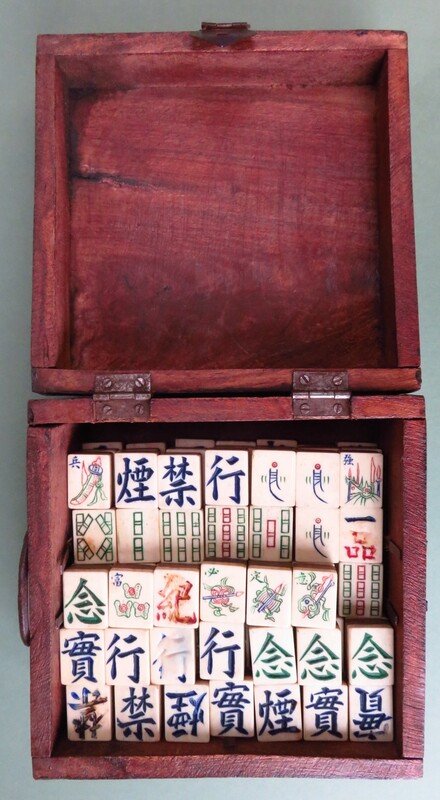 This case may not be original to this set due to the tiles do not fit completely. 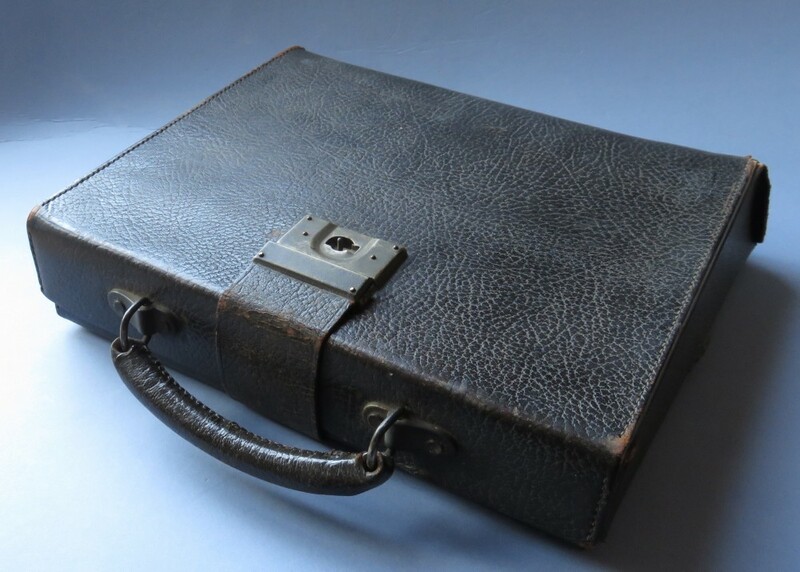 A view of the outside of the case. 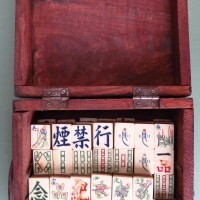 A Vietnamese set. Circa 1955. 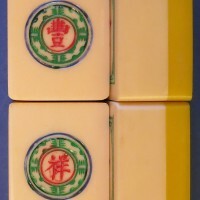 The tiles are large with white/cream tops with mustard yellow bases. Possibly acrylic. Hand engraved. 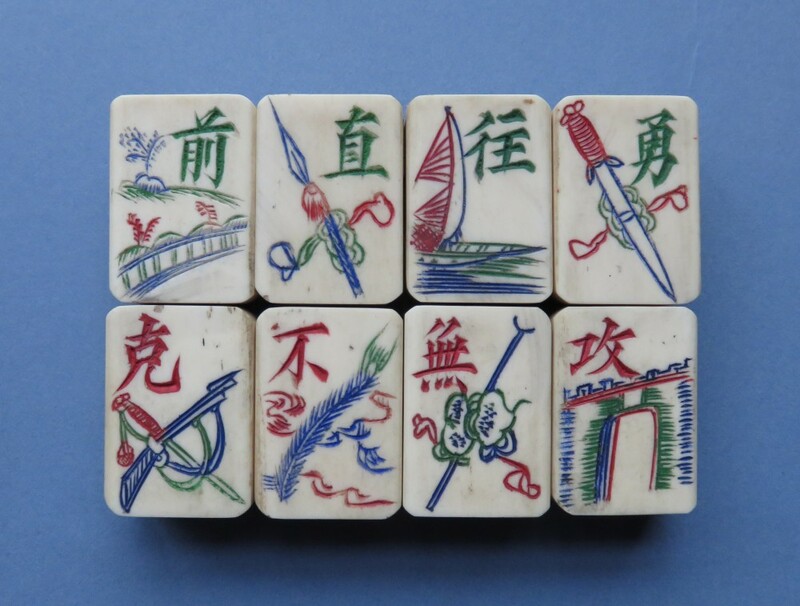 Four extra blank tiles are included, possibly to use as Jokers. 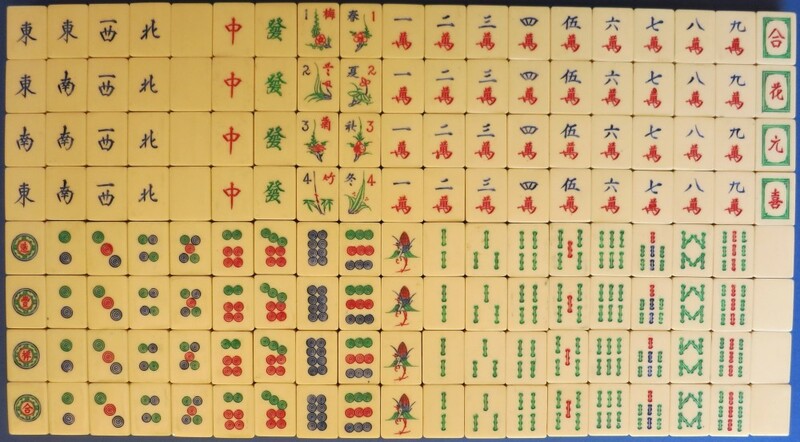 This arrangement shows how the framed ‘Kings’ tiles relate, as Substitution Tiles (Jokers), to their respective groups. 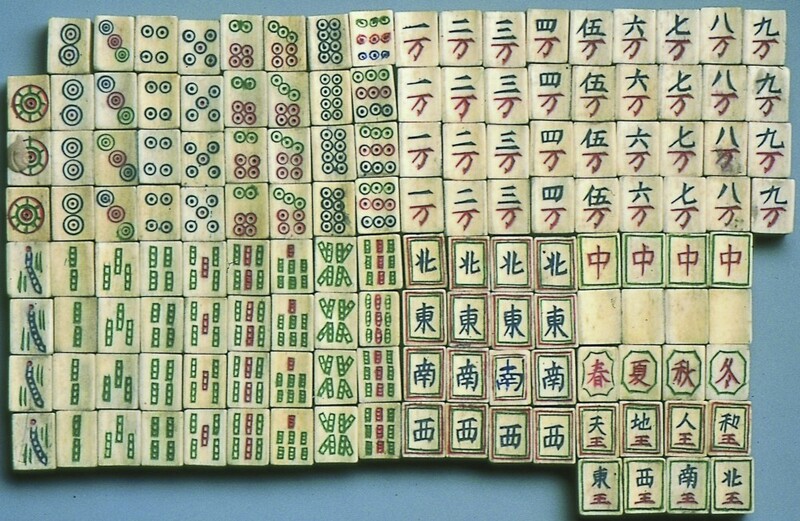 The wang (king) sinogram is missing but is understood to be present nevertheless. The Suits Joker is he (wang), to combine, join etc. The Winds (Joker) is xi (wang), happiness?. 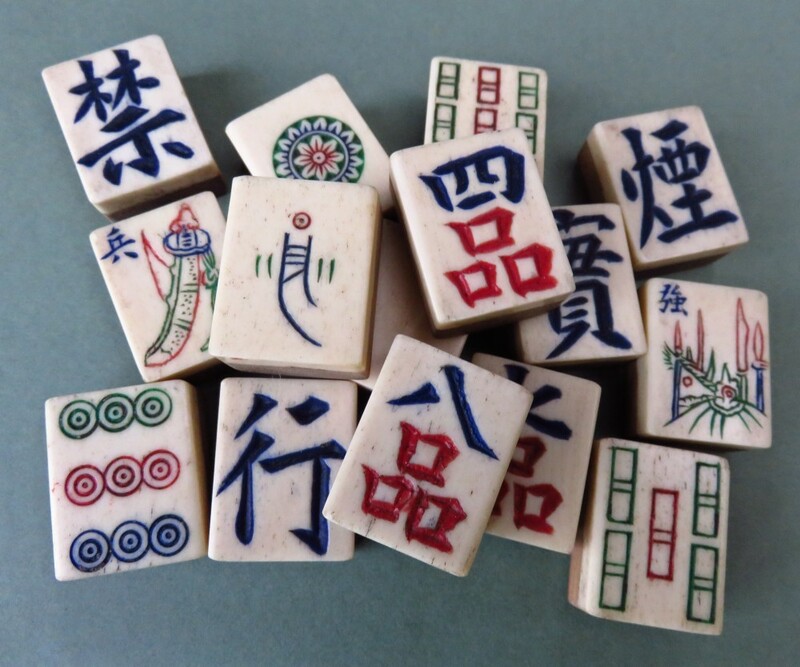 The Dragon Joker is yuan (wang), primary or origin - perhaps signifying that sometimes these three stand in for the three elemental tiles Heaven, Earth and Man? The Flowers Joker is hua (wang), Flower king. 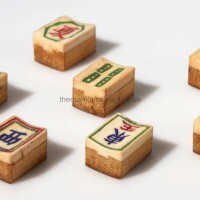 The one Circle tiles show, from top to bottom 造豐祥合, that is, Zao, create. Feng, plentiful. 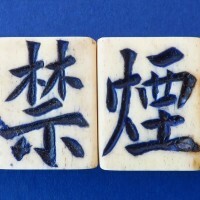 Xiang, auspicious. He, combination. 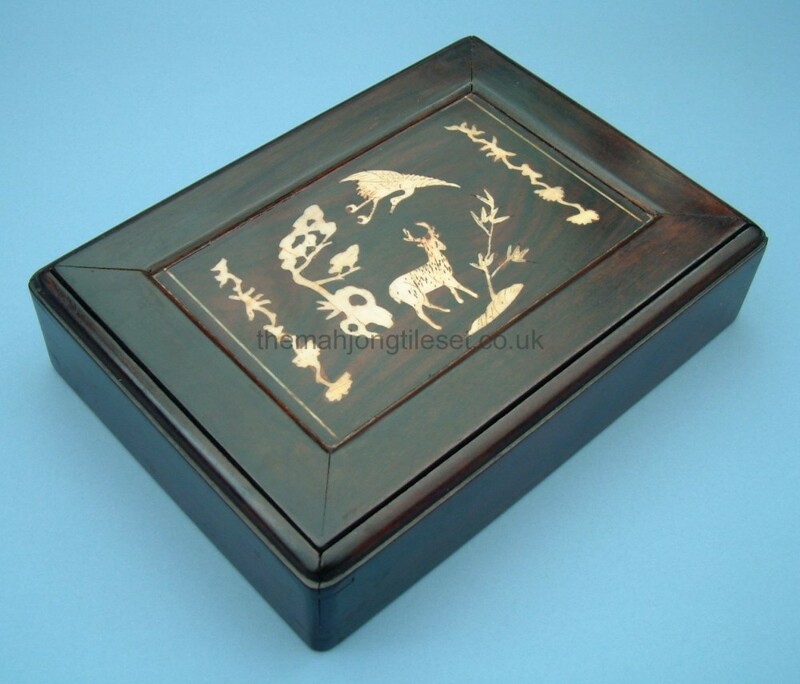 The best interpretation is this phrase may be the name of the manufacturer - "made by he feng xiang". The green engravings around the centre are perhaps bats. 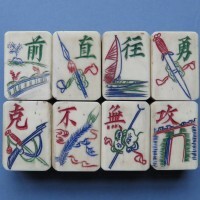 Vietnamese Tile Set-a. Private Collection. 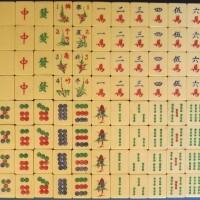 Vietnamese Tile Set-b. Private Collection.